Exploring and promoting psychoanalytic theory and its applications as a basis for understanding human experience and for various forms of psychotherapy. DSPP's members come from a number of mental health fields. Find out about more about DSPP and what we have to offer. Contact for our organization and other downloads and announcements. Read papers authored by members on topics related to psychoanalytic studies. I would like to introduce myself as the 2018-2019 President of DSPP as well as to introduce our new program year. I am a candidate psychoanalyst and licensed clinical psychologist with a private practice in Preston Center where I provide individual and couples' psychotherapy for adults and psychotherapy for children. I am also a tenure-track Assistant Professor of Psychology at the University of Dallas where I teach undergraduate and graduate students. I have authored a number of articles and chapters in the area of psychoanalysis as well as a book, Perversion: A Lacanian Psychoanalytic Approach to the Subject (Routledge, 2012). I am currently completing a co-authored book with Carol Owens, Ph.D., tentatively entitled In Two Minds About It: Psychoanalysing Ambivalence (on and off the couch), which will be published by Routledge in 2019. I am also the founder of the Dallas/Fort Worth area Lacan Study Group. I am excited to announce our 2018-2019 program year! This year's theme is "Desire and Love." Desire and love are cornerstones of human experience. As such, in our consulting rooms we regularly hear about problems with both. For example, as Freud pointed out in his 1910 paper "A Special Type of Object Choice Made by Men", some individuals love where they do not desire and desire where they do not love. Our patients speak about their desire being stuck, as in cases of depression and obsessional neurosis. They speak of not knowing what they desire, of impossible desires, of unfulfilled desires...When considering love, we might recall that the method of psychoanalysis could be said to have been born of love, because it was Anna O. 's transference love for Joseph Breuer that was crucial to her discovery of the talking cure. In psychotherapy and psychoanalysis, we hear about many problems in loving and being loved. Loving one's neighbor as oneself and loving oneself can both be equally difficult and fraught with ambivalence. Loving one's children, one's friends, one's romantic partner...Psychoanalysis and psychodynamic psychotherapy attend to the experience of individuals regarding all ways of loving and types of love, including both when love goes awry and when it heals, nourishes, and transforms human life. Our monthly meetings as well as our Saturday workshops will each, in their own way, address the topic of desire and love. Our fall workshop speaker, Bruce Fink, Ph.D., will present "On the Value of the Lacanian Approach to Analytic Practice and Love in the Analytic Setting." Our spring workshop speaker, Donna Orange, Ph.D., will present her talk entitled, "Learning to Hear: History, Psychoanalysis, and Radical Ethics." We will also have a May diversity workshop presented by Sheldon George, Ph.D., entitled "Lacan, Death, and the Mythic Structure of Race". Dr. George's talk is based on his recent book, Trauma and Race: A Lacanian Study of African-American Racial Identity. I am deeply grateful to the DSPP membership for creating such a vibrant community. I would like to thank my fellow executive committee members for making DSPP and our events possible. They include Past-President Carissa Scott, President-Elect Monty Evans, Treasurer Alicia Coleman, Secretary Christy Tucker, Member-at-large Scott Nelson, outgoing Member-at-large Anna Brandon, Arts Committee Co-Chairs Angelica Tratter and Denise Humphrey, Continuing Education Chair Berit Johnson, Membership Co-Chairs Jason Berman and Amanda Moates, Program Co-Chairs Jeremy Cooper, Christopher May, and Juan DeSantiago, and Presidents from recent years Zane Dodd, Scott Hickman, and Kenneth Trevino. Our first meeting of the year will be on Wednesday, September 12th. Monthly meetings will begin at 7pm. Drinks and snacks will be served from 7-7:30pm, and presentations will be held from 7:30-9pm. Monthly meetings are all held on the third Wednesday of the month with the exception of September. These meetings will take place at 12700 Preston Road, Room 125, Dallas, 75230. Please note that our monthly meeting room is no longer on the second floor as it was last year. The fall workshop, spring, and May diversity workshops will all be held in Room 100 at the same location. Founded in 1983, DSPP directs its efforts to exploring and promoting psychoanalytic theory and its applications as a basis for understanding human experience and for various forms of psychotherapy. DSPP's members come from a number of mental health fields and include psychologists, licensed professional counselors, social workers, physicians, and students. 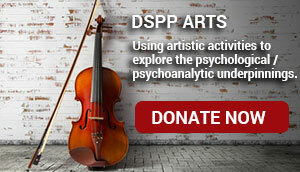 DSPP emphasizes the application of psychoanalytic theory to a variety of clinical settings.